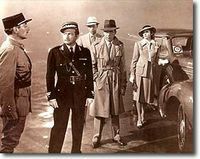 My all-time favorite movie has always been Casablanca. It had everything: great story, outstanding dialogue and musical score, wonderful leading actors, and probably the best supporting cast to ever perform in a Hollywood motion-picture. (I think of myself as a little like Capt. Louis Renault.) Movie buffs will recognize the significance of Bogart's line: "Have you tried number 22, yet?" It is in the spirit of Casablanca, that we are pleased to present the twenty-second edition of The Carnival of Education. As with other editions, those entries that were selected by us appear at the bottom of the page. The aim of the carnival is to present the widest range of thought that is out there in the EduSphere. For those who would like to peruse editions 1-21 of the Carnival, readers will find a complete set of archives at the bottom of this post. We would like to say a gigantic "Thank you" to all of those who continue to send submissions, mention the Carnival on their sites, and send supportive email. The Carnival of Education is a team effort; without your participation, none of this would be possible. As always, the secret for having a well-attended Carnival is publicity. Please consider helping to spread the word. The more folks that know about this collection of exhibits, the more that will "drop-in" and visit the midway. Trackbacks, links, and mentions all help. And, of course, your comments and constructive criticism are always most welcome. An Invitation: All writers and readers of education-related posts are invited to contribute to the twenty-third edition of The Carnival of Education. Please send your submissions to: owlshome[at]earthlink[dot]net. Contributions should be received no later than 10:00 PM (Eastern) 7:00 PM (Pacific) Tuesday, July 12, 2005. The Carnival midway should open here at the 'Wonks next Wednesday morning. And now.... let's see what the midway has to offer this week. In the olden days, it was called base ball. And exactly 100 years ago, a man nicknamed Moonlight Graham had a major-league base ball career that lasted for only one game. Rhymes With Right links to a remarkable article which tells us that after Graham hung-up his base ball uniform, he became a true hero by taking care of kids as a full-time doctor in a Minnesota mining town's school district. Have you ever heard of an internet phenomenon called "My Space.com?" If your haven't, and you are a teacher, administrator, or parent of a child over the age of 10, you really ought to check out this week's submission by A Passion For Teaching And Opinions. Who would have thought that "Myspacing" could have been a verb? It would be interesting to compile a list in a classroom with students of what they feel the gaps are in their knowledge are. Would they feel there are gaps, or does schooling knock ideas of creativity and curiosity out of them? Ironman at Political Calculations reviews a study done by the Dallas branch of the U.S. Federal Reserve that correlates an individual's average earnings against their years of education and how much economic freedom is available in their home country. The winners? Those with more education in the most free economies! Katie, over at A Constrained Vision, is covering one of the hottest topics in the EduSphere, that of teacher compensation. She takes a thoughtful and well-reasoned look at a debate between two economists on whether or not teachers are fairly compensated, and how compensation should be measured and compared. The subject of teacher compensation is also on the mind of Darren at Right on the Left Coast, ponders whether or not teachers are underpaid. Darren brings to our attention the fact that sometimes, it's all a matter of perspective. After teaching high school social studies, Outside [The Cave]'s Steve L. has moved to New York City in order to pursue his Master's at Columbia University. Before leaving his teaching assignment, a visiting college professor asked Steve's 120 students to provide some candid feedback on Steve's teaching. And of course they did. Didn't Art Linkletter once point out that "Kids say the darndest things?" Chris Correa is always on top of the latest trends in educational research. This week, Chris shows us a study that points out the significant correlation between students' overall health and academic success. Amazingly, researchers tracked down participants in an early childhood health program 25 years later in order to find the results! Does your local school still have its music program? At the California junior high where I work, the band director's job has been on the "block" several times, but we still have him. Mike in Texas isn't so lucky. With all the musical talent that is found among his teaching colleagues, he wonders why there isn't sufficient funding for a music program and yet monies can still be found (even in the Age of NCLB) for an "outdoors adventures class." Be sure to check out the photos of the "musical teachers." Have you ever had to sit in a college class and listen as the instructor lays down a series of absolutes that you know in your heart of hearts is simply wrong? See what happened at the University of Michigan when Spunky (who homeschools her six children) engaged her professor in a classroom dialogue over the prof's assertion that "no one has a free will." Here is a story that should make you smile. A generation ago, a family of poor Vietnamese immigrants came to this country, took advantage of the educational opportunities that were available, and now this family of doctors, engineers, and educators are now opening a school in order to "give something back" to the community. Brought to you by the intriguingly named site Banditsnomore who ask a question: Can Christian educators open similar schools? And if they did, would anyone come? In this new era of teacher accountability, what's the best way to assign grades for student progress? Should a single "0" be allowed to "pull-down" an otherwise good grade? At What It's Like on the Inside, they take a considered look at some alternatives to traditional grading. Mr. Babylon also brings us stories from the inside. His is a high school in New York City's Bronx. This week, Mr. Babylon tells us all about the last day of school for teachers. Key words and phrases: Payroll Witch, frogs, Scrabble, Curb Your Enthusiasm, disturbingly low-cut, and amateur renditions of Broadway showtunes. The thought of speaking in front of an audience causes most of us to break out in a cold sweat. And yet public speaking is at the heart of the teaching craft. Steve Pavlina is one of those lucky few that possess the ability to speak in front of a crowd professionally. In learning his craft, there was plenty of material on how to deliver a good address, but there was a dearth of information on how to manage the business of speaking. What solved Steve's problem? He found a Mentor, and, more importantly, he discovered how invaluable a mentor can be. Steve offers practical advice for those in search of their own mentors. Pamela of Atlas Shrugs has brought to our attention that the Commonwealth of Pennsylvania has passed an "Academic Bill of Rights" that should help protect students and professors from being "punished" for their political beliefs. In Miami, Superintendent Rudy Crew wants to close a couple of underperforming schools. The kids just aren't learning. Not surprisingly, many in the community want to keep one of the high schools open, but you aren't going to believe the reason why. Going to the Mat has all the details. At My Short Pencil, Jerry Moore examines an article in the Palm Springs Desert Sun that was critical of Governor Schwarzenegger's proposal to lengthen from 2 years to five years the probationary period for teachers. Teacher tenure is currently a hot topic for discussion in the EduSphere. In California, the question will be settled by the voters in a special election this November. How much computer literacy should students have? And should there be any standards imposed by the state, or is local control best? Over at Crossblogging, they examine the issues surrounding computers in the classroom. Why do so many folks resist the idea of a basic competency test for teachers? In California, I had to pass a test that was written at the ninth grade level, and yet almost all veteran teachers were terrified of even the idea of taking the test. (known as CBEST) Quincy, writing over at News, the Universe, and Everything, is thinking about fair ways of administering these assessments as well as who resists them and why. When we blog about education-related matters, how much credibility do we give any particular source? Jenny D thoroughly examines how one reporter's personal biases may affect the reporting of the story, and, consequentially, the lasting impressions that are formed by readers. This post is an excellent cautionary tale for all of us who read or write about education and things educational. It's convention time for the National Education Association. Joanne Jacobs has the latest on what the conventioneers have been up to, as well as the latest pronouncements from NEA President Reg Weaver. D.C. Education Blog is bringing to our attention that certain members of the United States Senate (Congress has much oversight when it comes governance of the District of Columbia.) are considering raising the $7,500 limit on its school voucher program. The debate over vouchers continues to resound through the EduSphere. Have you ever considered why municipalities may not be so keen on the construction of affordable housing? Over at The School of Blog, they gave a very plausible reason that I had never even considered. Key words: Kids, costs, education, and taxes. And finally, here at The Education Wonks, we humbly submit for your approval our post about how what the teachers are wearing to school has become an issue in districts around the country. The first edition can be seen here, the second, here the third, here the fourth, here, and the fifth, here the sixth, here the seventh, here the eighth, here the ninth, here the tenth, here the eleventh here the twelfth here, the thirteenth, here the fourteenth, here the fifteenth, here, the sixteenth, here the seventeenth, here the eighteenth, here the nineteenth, here, the twentieth, here and the twenty-first, over there. To get to EdWonk's main page, (with a variety of education-related posts) please click here. NEA's Convention Coverage: Fun And Frolic In L.A. Teacher Attire: Too Hot For The Classroom? Ninth Grade Is To Freshman As Fifth Grade Is To?